Remodeling your home is a good opportunity to check if your home is efficient in terms of energy consumption and renewable materials use. In most cases, energy efficiency is not the first thing that comes to mind when people start making improvements in the place where they live. Aesthetics and quality are the aspects that are most commonly considered in these circumstances. But the truth is you can have them both: energy efficiency and genuine design that makes you feel comfortable in your own home. Going green when you are about to begin a remodeling process also results in big savings in future energy bills. You could save up to 30% on your energy bill by making efficient upgrades when going ahead with a home remodeling project. In this article, you will learn about ways you can get a much healthier home. And that doesn’t mean getting rid of design and quality. Meanwhile you’ll save a few dollars in the process. If you are unsure about the energy consumption in your home, you should start by getting an Energy Audit. This is a great move to know exactly what you need to target in order to have a sustainable home. 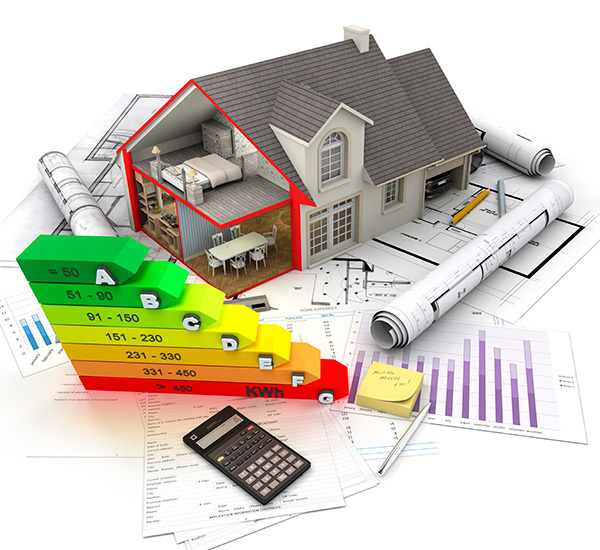 An Energy Audit will help you determine which purchases and improvements will save you the most money and energy. That way you’ll have a lead on where to start. Also you’ll make sure you don’t waste time and effort on something that didn’t need attention. On this stage, it is important to check for water intrusion, air leaks, gas leaks, HVAC leaks, inefficient insulation, inefficient lighting quality, potential combustion safety issues, appliance malfunctions, and excess of moisture. Remember that not everything is at a glance and there may be matters that you may not know that were there. For example, there may be hidden leaks behind appliances and built-ins. Energy efficiency improvements: switching to renewable energy sources. The days where solar panels were considered a futuristic approach to power your home are far behind. Solar energy has become a reality that is within the reach of almost everyone. Installing solar panels as a part of your home remodeling plan means that you’ll be able to generate your own power. It also requires minimum maintenance and you’ll be contributing to helping the planet by embracing a clean energy source. This energy source doesn’t involve fossil fuels. Not to mention that those are natural resources that will become very scarce in the near future. Home weatherization: Be fuel efficient. Another great point to address on your remodeling project is Home Weatherization. This involves air sealing, insulation, moisture control, and ventilation. Air sealing along with an effective ventilation system are cost-effective ways to cut heating and cooling costs. Having a home that is well sealed and without air leaks allows you to hold a more precise control of the indoor temperature. To achieve this, you will find multiple techniques that include caulking, weatherstripping, installing foam gaskets behind outlet and switch plates on walls, checking dryer vents in order to be sure it is not blocked and replacing door bottoms and thresholds, among others. Insulation has to do with controlling indoor temperature and helping your home’s energy conservation through improving your wall coating. It comprises three heat flow mechanisms: conduction, convection, and radiation. Getting a healthier home can be easily achieved if you switch to renewable energy sources and improve your house infrastructure. If you enforce a solid energy strategy including insulation and weatherization, solar panel installation, and indoor and outdoor water efficiency you’ll make a big difference! Efficient technologies: HVAC done right. A healthy home that cares about the environment does not mean that you can’t have a comfortable home no matter the season! It is no secret that air conditioners and heaters take a huge part in an utility bill. According to the Department of Energy, heating and cooling systems account for about 56% of the energy consumption in a typical home. This is mainly due to HVAC duct systems being installed in an inconvenient and inefficient spot (probably the basement or the attic). These are generally heated or cooled areas that result on the system working less to heat or to cool your home. This matter can be easily fixed by having a specialist analyze leaks and weak spots, as well as insulating the ducts. Installing double-glazed windows are also a great home improvement that will make your heating and cooling systems run efficiently. Water plays a major role on energy saving. Every home needs water, that goes without saying. And every home needs hot water, too. The way you get your water heated can also improve you energy consumption and it plays a big role on making your home a healthy home. One thing you should considering on your home remodeling project is installing a high-efficiency or solar water heater. And then, insulate it. It is really surprising how beneficial it is to the environment to get water heating directly from the sun. The insulation adds up to making it efficient as it makes hot water move faster and get to your faucet without having to wait. If you have decided to go for a home remodeling project, it means that you want to change and improve. Consider to have a specialist conduct an Energy Audit or implement some of the improvements mentioned above makes the difference on both your budget and your comfort. Changing for better and having a healthy home are not that difficult to obtain!